A crash was coming and my instincts were entirely right even though people did, of course, tell me I was wrong at the time. 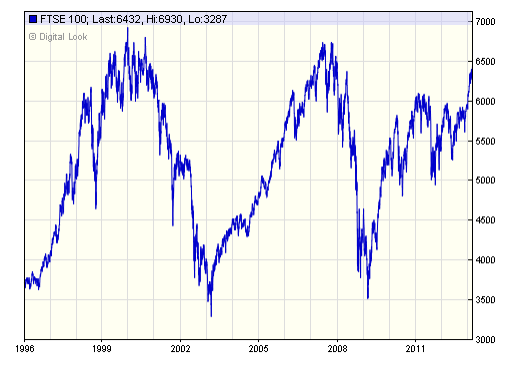 But note - the FTSE is at record levels again. Now in earnings multiplier terms it is not, I know. They are around 12 to 13 now and were 17 back in 2008 and you could therefore argue things aren't comparable, but that attributes a logic to markets they just don't have. Remember, after all, that the FTSE equity market is a just a market in second hand bits of paper called shares: it has little at all to do with raising cash for businesses. 3) We’ve set up an unsustainable savings structure for pensions and other purposes which means money has to be placed solely in derivative financial products (and even shares are that) and that there is no way funds can actually be used to invest in real economic activity – meaning financial markets are unrelated to that reality. I suspect all three explanations are right, in part. It doesn't take a genius to notice a pattern, does it? Nor does it take a genius to realise that when we're facing triple dip recession in the UK, the EU is in deep trouble, the US is facing Republican lead melt down and Japan remains in the doldrums the buoyancy of the BRICS is not going to sustain this growth. We may have a year or so before a crash, but crash the market will. Which is why what I wrote on pensions in 2003 and in 2010 continues to make sense. We have to invest pension funds in the assets that people want, can see and can ebenfit from and that deny the City the chance to fleece tose assets of value on the way. Those things are called schools, hospitals, transport infrastructure, housing and the green economy. These give rewards now and pay dividends until most people will be of retirement age - unlike most investment in equities or second hand shopping centres, which is the other great pension favourite, or even corporate bonds. I'll just lay down a marker: I could be wrong, but I doubt it. I have found that technical measures like ‘triple tops’ in stock markets are barely better than a coin flip. Clearly there is some disconnect between economic performance and stock market buoyancy and the ‘greater fool theory’ could be at play in stock markets today but there is not only the matter of earnings being much higher today than they were before the crash [especially in the US]but also the fact that interest rates are so much lower. Getting returns at negative real rates from gilts or banks [in some part due to monetary policy] rather than a dividend, combined with a better than 50/50 chances of capital appreciation [even if based on greater fool theory] can seem like a no brainer. My own feeling is that the market is particularly vulnerable to shocks. Any renewal of Euroland instability or nasty activities in the Gulf would be a big threat to markets…but then they do say all bull markets climb a ‘wall of worry’. The problem with the graph of the FTSE 100 is that it doesn’t show the total return including dividends. The same graph with dividends factored in would show a saw tooth, but one with a gradual upward trend. As you have said before in other articles the real value of a share must be the dividend it pays. The income v capital split escapes you then? The real value is in its net earnings and what return it generates on its invested capital, but you are correct with regard to dividends. As they are paid out by many companies when reinvested they will compound the return, which is what would happen with a pension fund. Longterm equities are the best option for the majority of people and there are numerous companies that invest in infrastructure, schools etc. So losing up to half capital value is compensated by a 3% rate of return? Thats the risk, if you dont like it dont take the risk, just opt out or consider an inflation linked bond fund. Actually up to 100% capital loss. Putting aside the stock market thing, I am against compulsory pensions, my view is that better financial education is required first and then the availability of low cost funds with transparent fee structures and ease of access, probably using index funds with ultra low fees (<0.10%). I think ISAs are the best option for the overwhelming majority, they are much simpler and you negate the whole issue of tax relief. Pensions lock money away that could be used to generate an income during times of uneployment or when you decide you have had enough of work at a time of your own choosing rather than the governments. The near involuntary drawing in of a large number of people into the stock exchange is part of a social and political engineering program that has been underway for the last thirty years. In the late 1970 Chris Patten made a report for the Conservative party recommending a way to engineer a change of social attitudes more favorable to the tories. He recommended the fire selling of council houses and turning a significant number of people into property owners so changing their self perception to one more prone to a conservative view point. Social housing was then about 30% of housing, mostly then council. Now its about 12.5% I believe. This policy was much admired by General Pinochet. It was a very successful piece of social and political engineering. It helped change the self identity of a significant portion of people so that we have ended up with 30 years of neo liberal dominated government. It has tended to made houses, things for speculation. Cultivated a nurdish individualism. The consequence is massive house price inflation. Banks and building societies have ridden this property price bubble. In a rising market they saw this as a one way bet. Consequence an lop sided economy and society. A large minority of people unable to enter the housing market. Run down stock of social housing mainly for the “socially excluded”. A shortage of social housing. Land lords as principle benefits scroungers. The housing benefits are there in large measure to prop up the high rents to then prop up property prices. You right if I understand you to point out the disconnect between investments into a speculative stock exchange where the operators siphon a cut from the thousands of exchanges; this with little connect to investments in the real economy. The pension managers and the city operators will milk fees while the pensions of folk with modest means will be put into play; helping to drive the spikes of stock prices before the next crash. As pensioners the subscriber has little if any control over those who manage their pensions but they might be fooled into believing they are stake holders in this muck. As I understand it, the rationale for the US and UK governments since 2008, has been to put the financial system back on the pre-2008 tracks. The imperative for the Federal Reserve, as described by Neil Barofsky the whistle-blower, was exclusively to ‘save the banks’ not the economy. The impending ‘bust’ following this unsustainable ‘boom’ shown by your graph could be seen as proof that they have succeeded. The financial sector are doing extremely well out of their fictitious capital, and many individuals on Forbes’ rich list will benefit from the coming bust (which Max Keiser predicts for this coming April). However, subsequent ‘trickle-down’ and investment in the real economy have been shown to be a sham. The movement of pension funds into the private sector is very worrying but all that money was/is irresistable to Wall street and the City of London…. Pensions capitalism! Sue – your link to Michael Hudson’s report gives a good analysis of how the US government chose to bail out AIG so that a conduit could be set up to refund the banks at the taxpayers’ expense. The CDOs used were unregulated financial instruments and there was no obligation to provide any financial support. A group of us put together this Wikipedia entry and you may deduce that collusion must have existed between banks, lawyers, accountants, credit rating agencies etc or they were all bamboozled by the sheer complexity of the instruments used. Thanks John .. I will go check it out. Sounds good! Because of my interest in monetary reform I have listened to some of Richard Werner’s lectures. It may be obvious to people on this blog but he advocates looking at the rate of credit creation by banks when predicting a crash. If credit creation exceeds the GDP of a country then a bubble is growing. This applies equally with mortgages, house prices and stocks. In this case it may depend on whether the companies have the business or if people are buying stocks with borrowings to get a quick profit in the greater fool scenario. Is there an up to date graph showing credit creation in the UK? A good proxy for credit creation is M4. The growth rate of this monetary aggregate has collapsed since 2008, and is now running at about the rate of nominal GDP. This means that, excluding credit to the government and its agencies, credit is probably contracting relatively sharply across the economy. A lot of people would say that another crash is the only way to get people to finally face head on the dead hand of greed and arrogance that has us in its absolute zero, -273.15C grip. However, if such an event happens, should we be prepared for that immediate after-shock to be added to the current after-shock and used to herd us towards more austerity and regressive thinking? The problem is that there is very little agreement in any sizeable camp on what to do otherwise. That’s why TINA still holds sway. Who says there’s no agreement Carol? Where is the unanimity in TINA? Because we see a daily stream of decisions and consequences from those who say TINA, which indicates disarray, with the only dominant consensus being ‘follow along the same road that brought us here’. Just because those who are in the TINA camp have made sure their voice is dominant in media, that their construction of ‘reality’ is foisted on us to accept as ours as well, or else ‘face the consequences’ doesn’t mean there aren’t alternatives. You’re reading Mr Murphy’s blog, so you must be aware of some of them. Perhaps Mr. Murphy, you should invest your pension where you want to, and allow me to be free to invest mine where I want to invest it without being told where to put it; i.e. without your artificial restrictions. In other words, keep your hands off my pension fund. But the option you suggest involves restricting choice, not adding to it. I’d rather have my pension in places that have the possibility to beat inflation rather than be virtually guaranteed to lose to inflation. I never suggested that you said pensions should be abolished, I stated that you wanted to restrict the type of investments into which those funds may be placed. Adding your suggested funds to the market place, so that those so inclined may purchase them if they wish, would be reform. Stating that your suggested funds are the only ones that may be invested in, which is what you have advocated, is not. Yes you did suggest they be the only form. Unless – of course – you’re suggesting that this would not restrict choice, but instead add choice? Why should you have unconditional tax relief? And the reason the tax deferral happens is because the government want to encourage people to save for their retirement. Your proposal entirely negates that premise by suggesting that an amount more than the ‘tax saved’ should be restricted as to where it can be invested, thus actually disincentivising people from saving for their retirement – they’d be better off not saving it and spending the post-tax income today, rather than putting it in a fund that effectively shrinks due to the effects of inflation. The problem is that by default we have our pensions largely based on the stock exchange. Have there been any problems with these pensions? Corporate Capital has generated a veiled totalitarianism. The above entity whines about choice but we do not have the choice to put our money into national mutual trust banks, we do not have the choice to invest in NHS Mutual Trusts to replace PFLs. Instead the City bleeds the public sector and the commonwealth held in trust for the nation fire sold to the plutocrats. They sell the family silver! Macmillan saw the hungry 30s and had some wisdom. The only sensible way to fund pensions is for current workers to fund current retirees via the national insurance vehicle. This would not prevent private saving for retirement, but this private saving should not be subsidised in any way. We are at risk of the FIRE sector scooping all the cream for ever. For once I have to agree – this has all the characteristics of a classic bubble and in fact is eerily reminiscent of the 2008 crash, which as you rightly point out was not widely (indeed you might well say barely at all!) predicted, only by yourself and a few other individuals then derided as naysayers. On a technical point, would you allow Local authorities to raise bonds themselves, or would it be undertaken at a national level within the UK? Assuming there’s no compulsion element (and in previous exchanges you have assured that there will not be) it seems what the Americans term a ‘no-brainer’? In terms of your view as to where the market is heading, I am inclined to agree with you. But it is worth noting that your explanations are unconvincing – in particular the three factors you cite as ‘explaining’ the irrationally high market are all long-term factors that aren’t going away. Added to which is governments’ insatiable appetite for QE. So really it comes down to looking at the graph going up and thinking it must come down. You could have said the same at the beginning of 2011, and missed out on the 2012 rally. If you are so confident I take it that you are short selling FTSE stocks? If your confidence is proved right you could easily make much more money from doing this than doing tax research. It’s also generally regarded as capital gains for day traders so the tax bill is lower on this activity too plus you get a significant tax free annual exemption. Better still, leverage your positions through spread betting. Let us know how you get on and good luck. Where do you put your pension then ? Eminently sensible choice of investment then. In Australia, the entire pension system (or superannuation as we call it) underwent a massive change in the early 1980s, when it became compulsory for all employees to be in a scheme and for all employers to pay 3% into this fund (that percentage has been hiked up over time). The Keating govt’s reasoning was that Australia wouldn’t be able to fund govt pensions in the future with the aging population to grow in the future. Every person would have to fund their own pension. Fine, I don’t agree with this entire argument, but we’ll leave that aside for another discussion. If the government really wanted people to save for their own retirement, why did they allow all this money to be invested in the share and property markets? Putting your retirement money into the share market (even if it’s in blue chips) is high risk. The investment industry salespeople are fond of the argument that over the “long term” the share market is the best place to put your money – but which “long term”? I’ve seen people with their investments over 10-20 years, looking to retire suddenly see their retirement nest-egg, chopped in half in some cases. They were in the for the “long term”. Retirement money should be in fixed investments used to fund needed infrastructure or projects. I might be wrong but isn’t this what Singapore did? My husband and I had our pension funds invested in Rothschild Asset Management by default – i.e., we did not know what was happening although our IFA did. When we realised we were losing thousands we thought that if they were going to lose our money anyway, we ought to invest in an ethical fund that we would believe in. Suddenly, just before he retired, most of our thousands reappeared! We were lucky in that way. I do not know how often that happens but the moral is invest in what you believe in, not in what they tell you will make the most money. IFAs know no more than you do. The FTSE has everything to do with raising money for businesses cheaply. Without the liquidity that the stock market creates for equity providers, the returns that they would demand would be significantly higher to compensate for illiquidity. This is evident in the price differential (relative to profitability) between a unlisted and listed business of the same type. Do you have any clue how little new equity funding is raised? Actually I do have a clue, there has been £190bn raised on the LSE since 2006. I wouldn’t call that a little. Firstly, predicting a stock market fall is a bit like saying there’s rain on the way – if you walk around saying the sunshine wont last for long enough, eventually you’ll be provided right. There is no skill in that. Markets rise and fall so positioning yourself as some sort of guru is rather absurd. Secondly, to apparently relish (‘looking forward to’) the prospect of millions of pensionioners and investors (and it’s ultimately people that own companies) seeing the value of their assets plummet is pretty unpleasant of you. If you’re so confident, short the FTSE and give the profits to a charity. A correction or even a crash would suit me fine as it should others, there are a number businesses I would like to increase my investment in at more attractive prices. The problem with the stock market is that many perceive it as speculation when it is actually a system that allows you to become a part owner of a business or many businesses if you want.